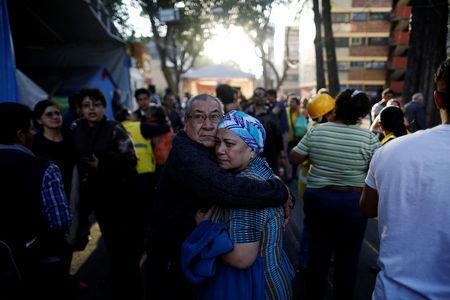 MEXICO CITY (Reuters) - A prolonged 7.2 magnitude quake that rocked Mexico on Friday left nearly a million homes and businesses without power in the capital and south but the only reported deaths came when a military helicopter crashed after surveying the aftermath. At least 50 homes suffered damage in the southern state of Oaxaca, which, along with Mexico City, is still reeling from earthquakes that caused widespread damage in September. The epicenter was about 90 miles (145 km) from Pacific coast surfer resort Puerto Escondido in the southern state of Oaxaca and had a depth of 15.3 miles (24.6 km), according to the U.S. Geological Survey. At least two people died when a helicopter carrying Mexico's interior minister and the governor of Oaxaca crashed while trying to land after a tour of damage from the earthquake, officials said. The senior officials survived. The powerful, sustained shaking on Friday gave way to 225 aftershocks, the national seismology service said, and caused widespread panic. In Mexico City, the seismic alarm sounded 72 seconds before tremors were felt, Mayor Miguel Angel Mancera said, giving residents time to flee to the streets. Patricia Gutierrez, a 66-year-old English teacher, was taking a nap with her 11-month-old granddaughter, Juliet, when she heard the distinctive siren. "She recognized the sound. When I opened my eyes, I saw her eyes in terror. Her eyes were wide, like plates. She didn't say anything," Gutierrez said of her granddaughter. Gutierrez managed to leave her ground floor apartment before the quake began. "I left the phone and everything except for my shoes and the baby," she said. Authorities said no deaths directly linked to the quake had been reported nationally. The Oaxacan town of Jamiltepec appeared to sustain the heaviest impact in the southern region, with 50 homes damaged along with a church and government building, the state's civil protection agency said. Patients were evacuated from a hospital there and from another in the nearby town of Putla Villa de Guerrero. On a local highway, a fire ignited when two high-tension electric cables struck each other. In the town of Pinotepa Nacional close to the quake's epicenter, a photo obtained from Oaxaca's civil protection agency showed a single-story building where a portion of the brick facade had crumbled into the street. A hospital was also damaged, and a collapsed structure blocked a major highway. About 100,000 people in Oaxaca had lost power, the state's governor said. National oil firm Pemex said its installations were in order, including its biggest refinery 240 miles (386 km) from the epicenter. A hotel operator in Puerto Escondido said his property had no damage. Tremors were felt as far away as Guatemala to the south. Images in the media appeared to show bricks and rubble fallen from buildings, and products tumbling off shelves in a supermarket. In Mexico City, tall buildings swayed for more than a minute as seismic alarms sounded, with older structures in the chic Condesa neighborhood knocking into each other, and some cracks appearing in plaster and paintwork. The Popocatepetl volcano south of the capital sent a kilometer-high column of ash into the sky, said Mexico's disaster prevention agency. Two young men standing by a building that collapsed in a Sept. 19 earthquake were still hugging minutes after the tremor. People crowded in the streets, one lady in her pajamas. Trees, overhead cables and cars swayed, and a fire truck raced down the street. Guadalupe Martinez, a 64-year-old retiree, said she was still shaking from shock. But the quake was a far cry from the tremors that struck Mexico in September, Martinez said. "This time it was strong, but it did not jump up and down," she said.